Discussions about culture make for a fascinating and often perplexing conversation. It’s as though people are searching for the secret herbs and spices, a means of short-cutting or ‘hacking’ their way to a high-performance environment. In my experience, strong cultures are the result of shared struggle and learning, most often over lengthy periods, building cohesion and trust as individuals develop the confidence and capability to ask tougher questions of themselves and each other, all in the context of the team. They reflect on their failings, try new approaches and experiment. They are prepared to force out incongruent individuals, eventually finding a solution and a way forward tailored to the team. I’ve been asked a lot in recent years about the Richmond Football Club’s recent success, which I have enjoyed greatly given my family’s (and personal) relationship with the club. When a team has unexpected success in high-profile sports, it draws a broad range of analysis. People look at the before and after, particularly changes such as new recruits, adjustments to game style, off-field restructuring etc. This is the stuff that fills newspaper columns, talkback radio, and the many football panel shows. This commentary is too obvious and somewhat disrespectful. Yes, changes made post-2016 played a role at Richmond, but at the heart of the club is a group of people who had the collective courage and fortitude to work it out for themselves, in the face of criticism, and efforts to unseat them, including a couple of Board takeovers. There is great cohesion in the Richmond group, deep respect for each other, as well as a nuanced understanding of their relative strengths and weaknesses, and respect for their differences. It transcends from President to CEO, to the coach and his players, who are playing for each other, clearly the core aim of any high-performance culture. They’ve asked the hard questions of themselves, made some tough decisions, the most significant of which was to stay the path. They have shared the tough times, the nearly moments, and set a new standard, not only for themselves but for the competition. It is an overnight success story many years in the making. The challenge now is to bounce back from a year that finished a week too soon. 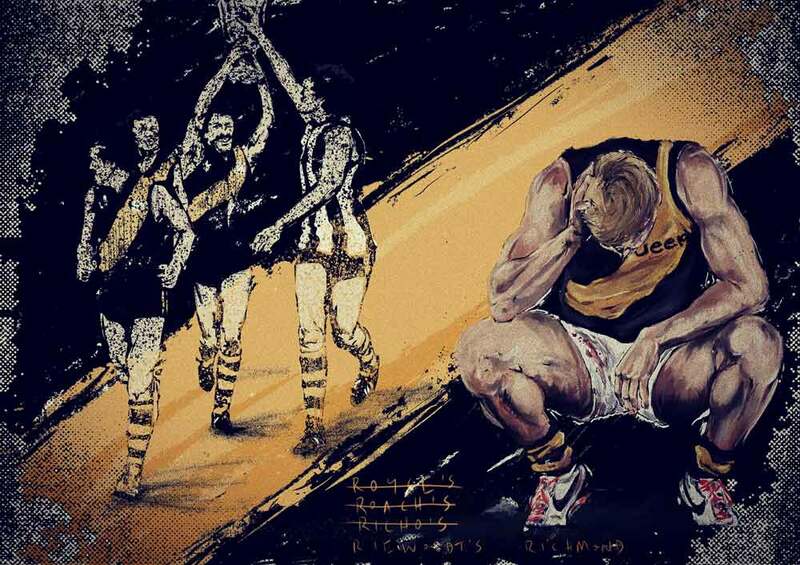 * My drawing is of Jack Riewoldt, a player who epitomises the Tiger journey over the last decade, with the ghosts of the previous Richmond Premiership in the background. * I grew up as a fanatical Tiger supporter, with my father Alan CEO of the club in the club’s Premiership era in the 60s and 70s. I also spent six years as CEO of the Tigers, appointed at age 24, during an era when the club struggled for survival.